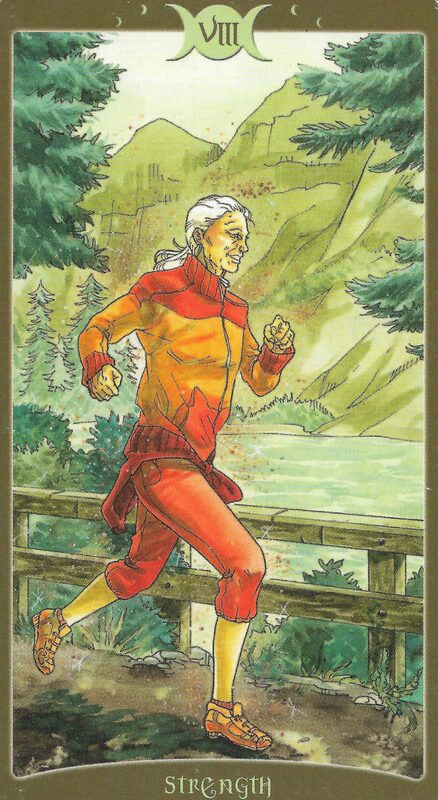 It’s the 29th week of the year and the card of the week is the Strength. The Sun entered Leo on Friday where he will stay until 8/22/16. So it’s appropriate that the the card for the Sun’s first full week in Leo is the Leo ruled Strength. This week, you will be called upon to be strong. You will be called to tame the lion within you when provoked but you will also be asked to stand up for yourself and your beliefs against those who may not have your best interests in minds. Your endurance will be tested, but if you trust your intuition, you will come out stronger than before. It’s the 29th week of the year, which adds to 2 in numerology, a number of balance. Mantra: Our greatest weaknesses can often be transformed into our greatest strengths. 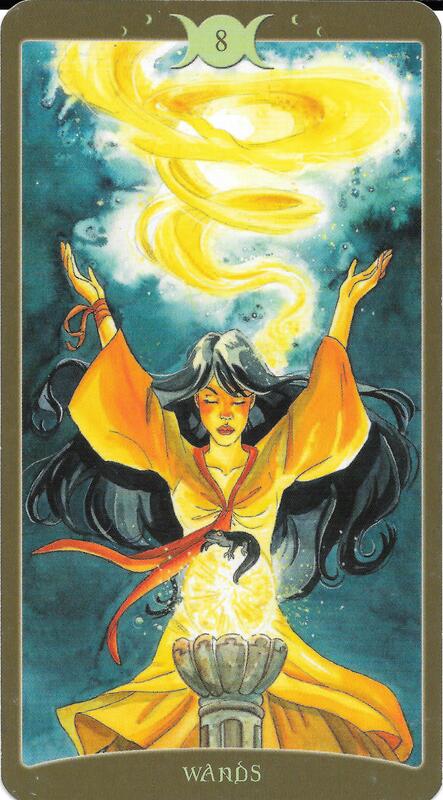 If you are seeking answers, the High Priestess tells you to look within yourself. Moon square Pluto at 8:29 AM PST will leave you feeling compulsive. You will be asked to take an honest look at your feelings and evaluate them without any excuses. Only then will you grasp the information you need to find out what you really want. Moon trine Venus at 9:48 AM PST assures you that whatever you discover will bring messages of love. Moon trine Mercury at 7:55 PM PST will get communication flowing so any issues that come up that need to be discussed will be understood and well received. Moon conjunct Uranus at 11:18 PM PST could bring the urge to act out rashly in the name of annoyance. Practice self control. The Moon is in the fiery sign of Aries for most of the day so passions will run high. The number of the day is 5, a number of overcoming hardships. 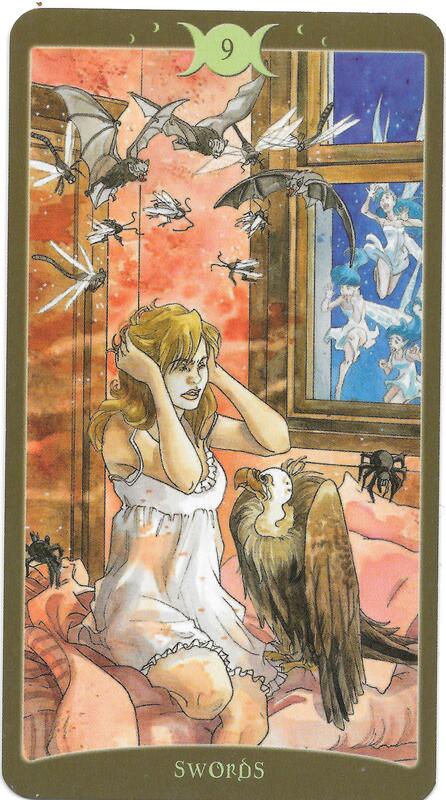 The 9 of Pentacles is a card that appears when worries constantly cycle through your head. But once you realize that the problem you’re obsessing over is just all in your head, you’ll be able to regain control. Moon square Sun at 4:00 PM PST could bring disruptions to your routine. You may feel irritable but if you try your best to approach difficult situations from a problem solving perspective, you’ll be able to quiet your worries. The Moon is Void of course until 8:37 AM PST when it enters the artistic but sometimes selfish sign of Taurus. The number of the day is 6, a number of victory. Mantra: I’m the only person standing in my way. 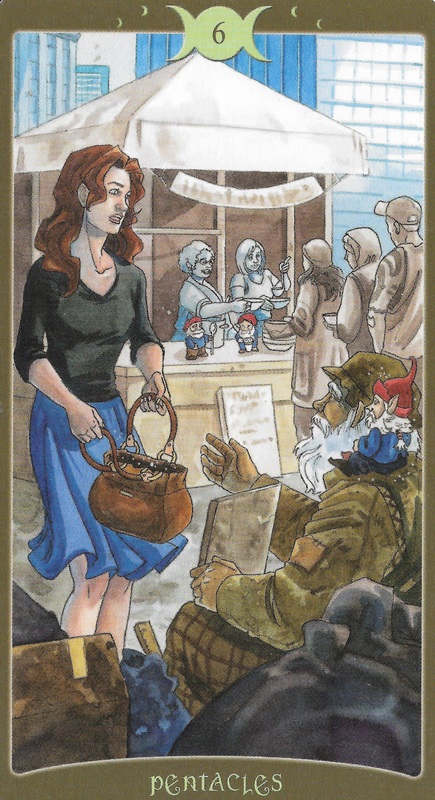 The 6 of Pentacles is a card of giving and taking. What can you give back to those who have given to you? Mercury trine Uranus at 12:45 AM PST has the potential to bring a message that is so riveting that it will change your life. If you are asleep during this transit, this message could present itself in a dream. Moon sextile Neptune at 4:11 AM PST will bring you the insight you need to follow your intuition. This will bring understanding that will help you process any message you received during the Mercury/Uranus transit a few hours earlier. Moon trine Pluto at 11:12 AM PST could leave you feeling a little sensitive thanks to your new discoveries. But instead of giving in to obsessing over things you can’t understand, if you are in the appropriate place with an appropriate person, find empowerment in your sexuality. Moon square Venus at 5:23 PM PST 5:23 PM PST could cause you to act out selfishly. Don’t be a spoiled brat and think of others. Moon trine Jupiter at 8:44 PM PST will bring an optimistic feel to the evening. Generosity is in the air and what you give will come back to you. The Moon is in Taurus, presenting you with the opportunity to see all the love and beauty around you. The number of the day is 7, a number that asks you to evaluate your life and see where you have room to give. Mantra: Because I appreciate everything that I have, I choose to share my abundance with others. 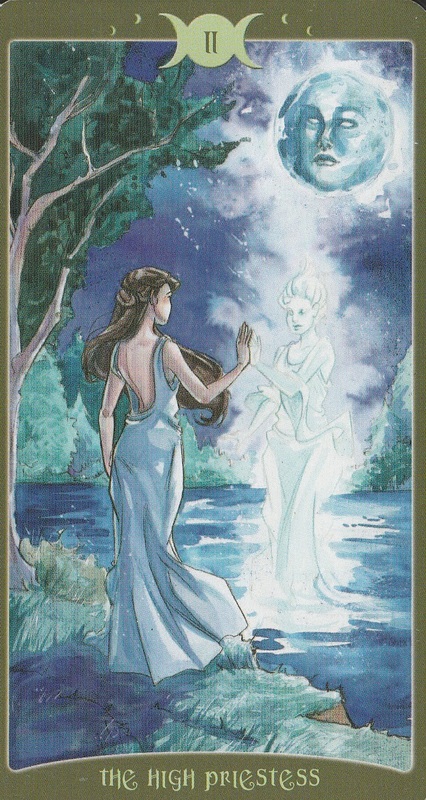 The 9 of Wands is a card that appears when you feel that you are so close to your goals but they seem so far away. Maybe an unexpected event threw a wrench in your gears or maybe there’s just one piece of the puzzle that won’t fit in order for you to move on to the next stage. Think back to another time something similar happened. How do you get out of that situation? Moon square Mercury at 5:17 AM PST brings challenges in communication. Moon opposition Mars at 8:13 AM PST could leave you feeling irritable if you’re having problems communicating with others. Don’t fly off the handle because you’ll get knocked for a loop if you do. Moon sextile Sun at 10:17 PM PST will bring a break in all the tension and the night should end on a positive note. The Moon is void of course for a short period in the morning and then it will enter the moody, restless sign of Gemini. The number of the day is 8, a number of karma. 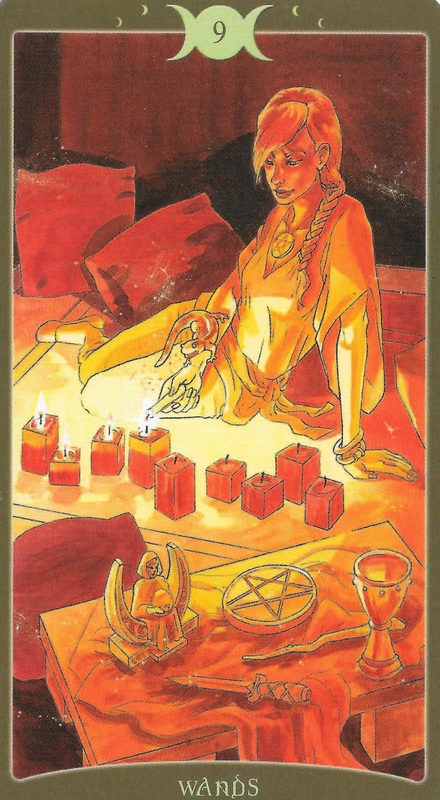 When the 8 of Wands appears, expect a sudden change. Moon opposition Saturn at 4:06 AM PST could bring depressing energy to your early morning hours. Because of the sensitivity in the air, you may take things the wrong way with Moon square Neptune at 6:45 AM PST. This is a time when reality can be a little blurry so withhold judgement until the transit passes. Mercury square Mars at 1:49 AM PST could bring challenges in dealing with others. Stand up for what you believe in but don’t be over defensive. Uranus stations retrograde in Aries at 2:06 PM PST where He will stay until 12/29/16. While Uranus is in retrograde, we may seek feel the urge to “break” things in our life in the name of revolution and reform. However, this destructive nature is usually fueled by anger so replace the urge for destruction with the urge to transform. The Moon is in the speedy, windy sign of Gemini. The number of the day is 9, a number of near completion. Mantra: The winds of change are blowing. 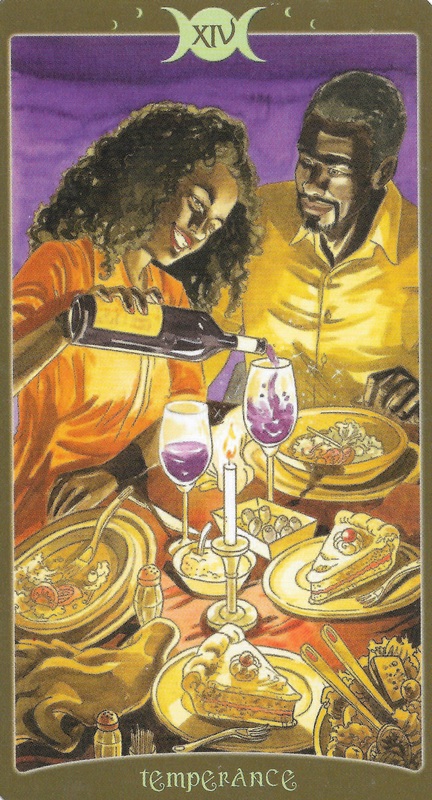 Temperance is a card of balance. When Temperance appears, we are called to neutralize our passion with compassion and to quench the thirst of our fire with cool, soothing water. It is time to come back to the center. Moon square Jupiter at 12:06 AM PST could bring arrogant, egotistical energy to your early morning hours. However, the negativity will be short lived because Moon sextile Venus will give you the opportunity to soothe any uncomfortable feelings with love and beauty. Moon sextile Uranus at 4:46 AM PST will find you wanting to meet new people and try fun things. Mercury enters Virgo at 11:19 AM PST where He will have an extended stay until 10/16/16 thanks to Mercury Retrograde which begins on 8/30/16. While Mercury is in Virgo, people may obsess over details. Many will prefer to follow more than lead. Moon sextile Mercury at 2:30 PM PST will bring good conversation and communication to your afternoon. The Moon is void of course until 2:09 PM PST when it enters the emotional sign of Cancer. The number of the day is 1(0), a number of endings becoming beginnings. This entry was posted in art, Astrology, dreams, mysticism, numerology, occult, self help, spirituality, Tarot, witchy, Writing and tagged abundance, astrology, card a day, divination, dreams, empowerment, inspirational, magick, manifestation, mantra, meditation, metaphysical, motivational, mysticism, numerology, occult, pagan, predictions, psychic, self empowerment, self help, spiritual, spirituality, tarot, tarot reading, tarot weekly forecast, wicca, witchcraft, witchy, writing. Bookmark the permalink.